At A. Mac Contracting, we are a commercial asbestos remediation company, specializing in commercial asbestos removal in NJ and NY. It is our desire to see that every commercial building is free from asbestos so that the occupants and visitors to such buildings are not in any risk of being affected by this deadly element. We have been offering commercial asbestos removal services for over two decades now, during which we have developed the skills, expertise and also we have the necessary equipment to facilitate safe and expedite the process of commercial asbestos removal. If you are the owner of a commercial premise or you are working in a commercial building that was constructed before 1978, then there are higher chances that asbestos was used as an insulator and fire retardant in the building. It is imperative that you call experts like A. Mac Contracting to conduct survey and do necessary commercial asbestos removal, even if very minor traces are found. Since properties are different, we don’t offer a one-size-fits-all solution but rather customized solution for each and every commercial asbestos removal project we undertake. 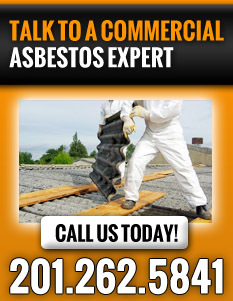 Therefore, feel free to contact us for our reliable commercial asbestos removal services in NJ and NY.